Deadline for Absentee Ballots to be in Clerk's office: Aug. 21 - 7:00 p.m. Deadline for Absentee Ballots to be in Clerk's office: Nov. 6 - 7:00 p.m.
Absentee / mail ballot: Registered voters can request absentee ballots for all elections in 2018 as early as January 1. Absentee ballots may be requested at any time but not on the day of the election. To request an absentee ballot(s) - Call Elections at (307) 633-4242 or email election@laramiecountyclerk.com. Give us your name, date of birth, residence address in Laramie County, and address where you want your ballot(s) mailed. Early voting: Vote early in the Atrium of the Laramie County Governmental Complex. Early voting begins 45 days prior to an election and ends the day before the election. Vote Center on Election Day: Vote at any Vote Center on Election Day. You may go to the center nearest you. 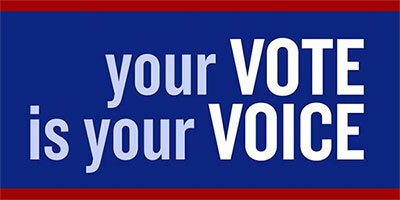 Visit the Laramie County Clerk's Election Office or your town clerk in Albin, Burns or Pine Bluffs. Bring your valid, government-issued photo ID. Register by mail: Download the Voter Registration Form and follow the instructions. Sign the registration oath in the presence of a Notary or Registry Agent and have the Notary/Agent sign the form. Mail the form and a copy of your ID to the Laramie County Clerk's Office, PO Box 608, Cheyenne, WY 82003. When you request an absentee ballot, give us your name as listed on the voter registration roll; date of birth, Laramie County residential address, and the address where you want your ballot mailed. Make Your Vote Count. Absentee ballots must be returned to the Clerk's office not later than 7:00 p.m. on Election Day. Ballots arriving after the deadline will not be counted. 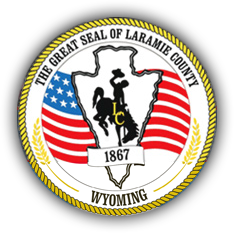 Mailing within Laramie County may take seven (7) days, longer if mailed from outside the county. Click here and enter your address. Information will appear on the right side of the screen.